This document describes the operation of the BJD1800 Electron Beam Evaporator. This tool has a 6kW power supply and is equipped with a auto valving sequence for pump down and venting. It has 6 pockets from which 6 different materials could be evaporated without breaking vacuum integrity. Refer to process data for materials and rates. 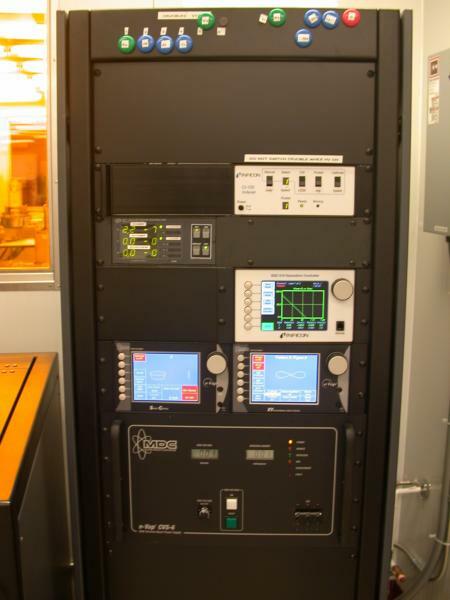 The evaporator uses high voltages (10kV) to accelerate electron toward the target. As such, even when the electron gun is off, some remanent charges of several thousand volts can still be present in the tool. As this can represent an lethal hazard, it is absolutely forbidden to open the front panel of the tool. MDC Sweep controller: control how the beam is scanned across the crucible. * Get the crystal state by using the Deposition Controller. Press on Next Menu until Sensor Info appears as part of the menu. Press Sensor Info and the read the % of the crystal. REPORT TO STAFF IF CRYSTAL IS BELOW 50%. Wait until pressure is about 7.4e2 Torr or more and open the chamber and you will hear the N2 flow sound, switch the MAN VENT / AUTO toggle on MAN VENT to stop N2 flow. If the glass slide is at the top view port hasn't been replace, place a new one. Verify using the magnet at the top of the electronic rack that the needed material are loaded in the turret. Close chamber and press AUTO START button. The tool will go into an automatic sequence of pumping starting by roughing out the chamber with the mechanical pump and when the reaching 70mTorr, the HIVAC valve will be opened allowing the cryogenic pump to bring the tool to high vacuum stage. DO NOT TURN THE FILAMENT ON WHILE THE VACUUM LEVEL IS ABOVE 5e-5 Torr. FILAMENT WILL LIKELY BURN. 1. Glass slide need to change? 2. Enough materials left in crucible for you deposition? 3. Is current material in crucible right one for your deposition? 4. Do a complete rotation of crucible turret in Clockwise, to make sure the rotation is correct. NB: When your deposition time is more than 30 minutes, please break the deposition into 2 or more cycles. The sample holder is very hot after long time deposition. 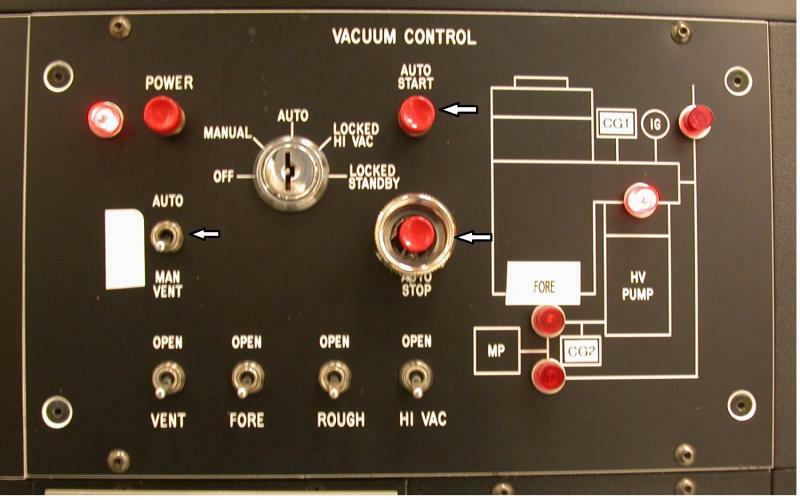 Choose a process from the Deposition Controller. Report to Process Table to find and choose the wanted process. Verify the sweep pattern corresponds to the first film to be deposited. Refer to Film Table. Press start on deposition controller and then press start layer. The power (%) will rise to setpoint 1 and soak for determined amount of time to allow the material to melt slowly. Close chamber and press AUTO START or use the manual pumping sequence in case AUTO START doesn't work. Switch OFF the ROUGH toggle and switch the HIVAC toggle ON. This will open the HiVac valve to allow the cryogenic pump to pump the chamber. switch the VENT toggle to ON and wait until pressure is >6.9e2 Torr.